Mark Wahlberg and Brie Larson hits the tables in The Gambler. Mark Wahlberg (Ted) stars in the 2014 drama-thriller The Gambler, based on the fine 1974 film starring James Caan (Rollerball). 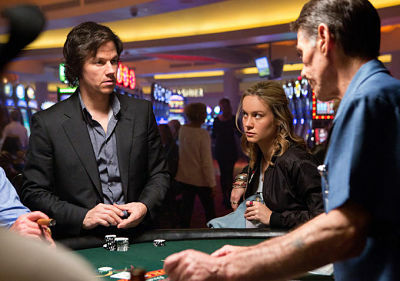 Wahlberg stars as Jim Bennett, a literature professor with a severe gambling addiction caused by his view of the world as either having it all or having nothing. When Jim gets in over his head and is forced to borrow money from a notorious gangster, he places his life and the safety of others in mortal danger. With time running out, he must raise his own stakes, enter the criminal underworld and risk everything to keep from losing it all. While the original film was written by James Toback and directed by Karel Reisz, the remake was helmed by Rupert Wyatt (Rise of the Planet of the Apes) and written by Academy Award-winner William Monahan (The Departed). Cast members include olden John Goodman (Argo), Brie Larson (21 Jump Street), Michael Kenneth Williams (TV’s Boardwalk Empire) and Jessica Lange (TV’s American Horror Story). The film was tepidly received by the critics and at the domestic box office, where it rang up a blah $34 million in wide release. The Gambler Blu-ray Combo Pack with Digital HD features an hour-plus of bonus content including a look at the filmmaking process, Mark Wahlberg’s character transformation, deleted and extended scenes, and more. Also, for a limited time, the Blu-ray Combo Pack available for purchase will include an offer for $15 off sports tickets at Ticketmaster.com (U.S. only).